Replacing a BMW X5 window regulator is the process of swapping the faulty regulator and substituting it for another new part. Use these procedures when replacing a BMW X5 window regulator on 2000 thru 2006 models. An automatic window that rises and lowered in a staggered or stuttering motion is likely the result of a window regulator in need of repair or replacement. You can take your BMW X5 to the dealership or third-party mechanic to have the issue addressed, or you can replace the window regulator yourself and save time and money in the process. Begin by removing the weather stripping located on the inner lip of the door experiencing the window problems. Remove the door panel from the door by prying it free with a trim panel remover or other prying tool. Look for the cables that connect the lock mechanism. Unhook the cables and allow them to hang free from the door. Remove the sound insulation that lines the door with a trim panel removal tool and your fingers. Set the sound insulation aside for further re-installment. Make sure the ignition is turned on and lower the window nearly all the way down. Allow at least a few inches of the window pane to be visible above the lower window opening edge. To remove the window, grab the top of the glass and lift up and toward the rear of the vehicle. The window regulator sits below the lower edge of the window pane and will be easily accessible once the window pane has been removed. Removing the window regulator requires that you remove the nuts to the rear of the apparatus with pliers. Once the nuts are removed, pull the window regulator from the door. Detach the cable holding the regulator to the door to free it completely from the X5’s door. 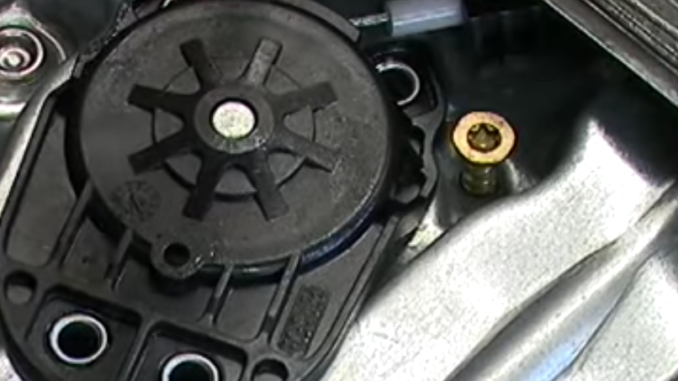 Disconnect the regulator motor from the window regulator and attach the motor to the replacement regulator. Before installing the replacement regulator, connect the regulator cable to the new regulator. Slide the new regulator and regulator motor into place along the inside of the BMW’s door. Start at the front of the door and work your way toward the rear of the vehicle until the regulator and motor are fully seated. Replace the nut you removed to extract the old regulator wit a set of pliers. Slide the window pane back into the window slot and rest it onto the new regulator. Tighten the window mounting screws to secure the window into place. When replacing the sound insulation into the door, use butylene tape to stick the insulation back into the door. Replace the weather stripping along the edge of the door to complete your window regulator replacement project. Application: Window regulator replacement procedures apply to the 2000 2001 2002 2003 2004 2005 2006 BMW X5 E53 Crossover 3.0 liter, 4.4L V8, 4.6L V8, 4.8L V8 and Diesel 3.0L M57 I6 models.